If you’re looking for power across all applications, this is the torch for you. 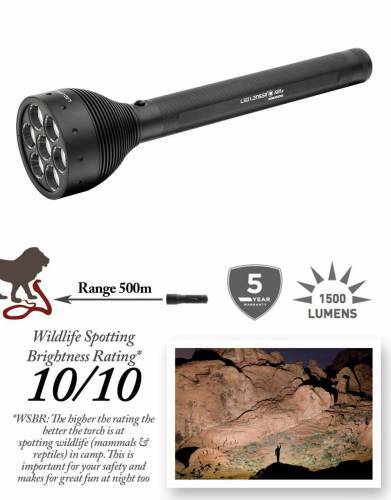 This large multi-LED hand torch produces such a cannon of light that even some car headlights seem dim by comparison. 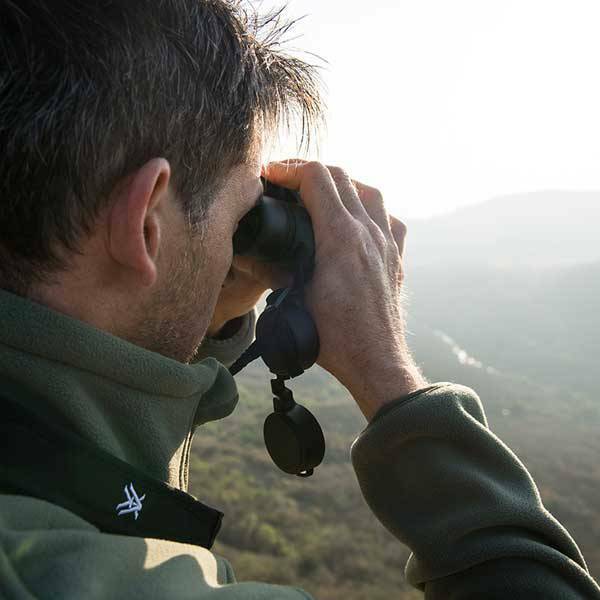 When Steve Backshall of Discovery Channel fame saw that we stocked the X21.2, he quite simply had to have one. In Steve's own words, "I notice that The Safari Store stock the Ledlenser X21.2. This would be a very welcome addition to my filming kit - we do loads of night spotlight filming that this would really help with." We agree with Steve. This torch may be summed up in one word: 'extraordinary'! 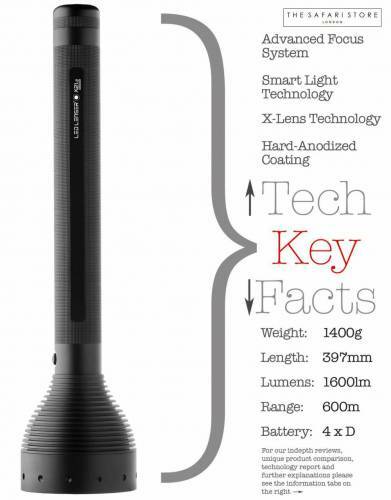 The X21 Ledlenser weights only 1.40kg, yet serves up over 500 meters of extremely bright light. 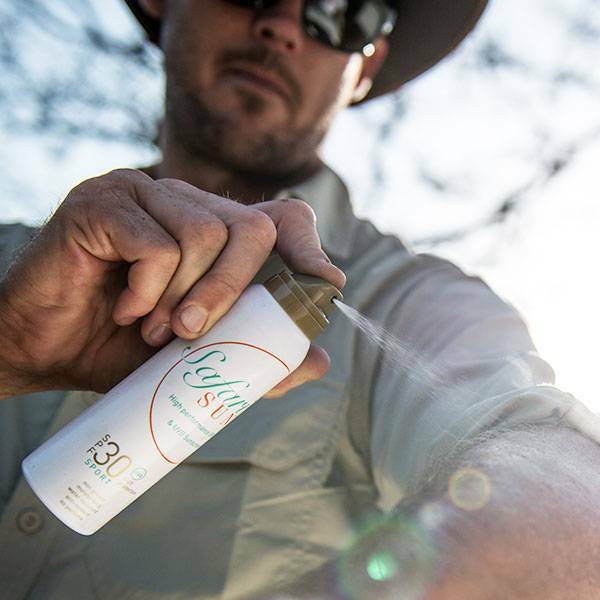 If you are after the ultimate torch for just about any task, including safaris, then look no further. This masterpiece is another milestone in the history of Ledlenser. The Ledlenser X21.2 will cause a sensation because it allows for a whole range of new applications in light engineering. The lamp has a light output of up to 1500 lumens. Thanks to the Advanced Focus System, the light cone can be adjusted dynamically. You must have held this lamp in your hand to be able to really appreciate it. The Ledlenser X21.2 offers a broad, circular low beam, as well as a sharply-focused searchlight beam. Seven ultra-bright high-performance chips and seven terminator lenses produce a quality of light that you have never experienced before - a blazing beam. This lamp’s lighting range is already legendary and its impressive appearance radiates power and authority. 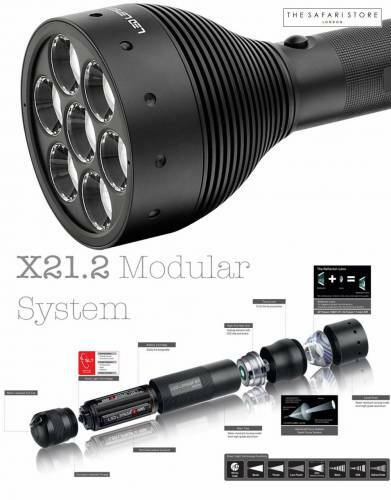 The X21.2 is a part of the High-Performance Line from Ledlenser, which combines innovations unprecedented in the history of flashlights. The reflector-lens of the Advanced Focus System, the Speed Focus, their Dynamic Switch concept, and the incredible luminous intensity of their chips are but a few of the novelties that will revolutionise the world of flashlights and torches.